POHANG, Republic of Korea - Navy Maritime Prepositioning Force ships USNS Pililaau (T-AK 304) and USNS 2nd Lt. John P. Bobo (T-AK 3008) successfully utilized the Improved Navy Lighterage System (INLS) to discharge equipment and cargo in support of Combined Joint Logistics Over The Shore (CJLOTS) 2017, April 8-12. The INLS is a sea state three (SS3) capable causeway system that resembles a floating pier comprised of interchangeable modules and is used to transfer cargo from Military Sealift Command (MSC) ships to shore areas where conventional port facilities are unavailable or inadequate. The successful deployment of the INLS for CJLOTS 2017 demonstrates the U.S. and Republic of Korea's (ROK) ability to transfer cargo from ships anchored at sea to the shore, improving logistics interoperability, communication and cooperation between the U.S. and the ROK. "Training with our allied partners using this system is of the utmost importance," said Chief Warrant Officer 2 Jokim Davis, Combat Logistics Regiment 35. "By doctrine, we can offload without coming into view of the beach, so we can be over the horizon, 12 to 30 miles out, and discharge equipment outside of view. It improves our response time, as now we don't have to look for a pier that can support the ramp and the equipment to be offloaded." The INLS is comprised of various pontoon sections that can be assembled in a variety of ways to create a Roll-on/Roll-off Discharge Facility (RRDF). MSC prepositioning ships discharge equipment onto the RRDF, then onto lighterage, such as barge ferries or landing craft utilities, for transportation to the shore. 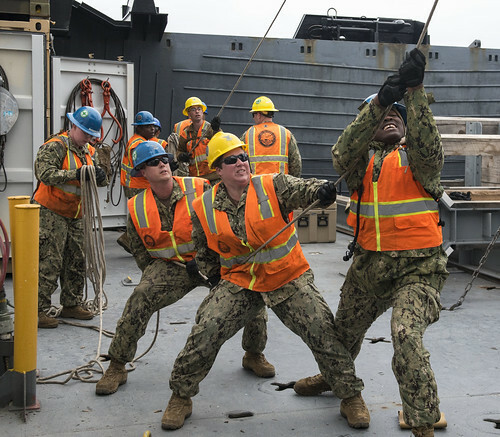 "The RRDF enables us to do ship to shore movement in any situation," said Boatswain's Mate 2nd Class Kasey Murchison, Amphibious Construction Battalion One. "This capability provides us the ability to respond more quickly as we can have the RRDF offloaded from the MSC ship and assembled within 36 hours." Utilizing the Instream Discharge and Lighterage Operations, U.S. Navy, Marine Corps and Army exercise participants offloaded approximately 620 pieces of rolling stock and containers while ROK forces offloaded approximately 1,600 tons of rolling stock and materials. MSC operates approximately 120 non-combatant, merchant mariner-crewed ships that replenish U.S. Navy ships at sea, conduct specialized missions, strategically preposition combat cargo at sea around the world and move military cargo and supplies used by deployed U.S. forces. CJLOTS is a biennial exercise conducted by military and civilian personnel from the United States and the Republic of Korea, training to deliver and redeploy military cargo as a part of Operation Pacific Reach Exercise (OPRex) 2017. 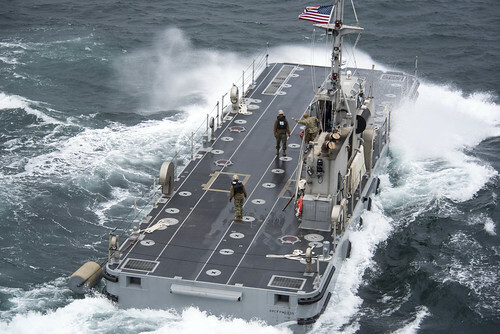 OPRex17 is a bilateral training event that highlights combined and joint multi-domain, multi-nodal capabilities by exercising an Area Distribution Center (ADC), an Air Terminal Supply Point (ATSP) Logistics Over the Shore (LOTS), and the use of rail, inland waterways, and costal lift operations to validate the operational reach concept. OPRex17 is a part of the annual Korean Peninsula defense exercise Foal Eagle 2017.